The ultimate addition to your home is an Orangery which is an extension built using materials to match the fabric of the existing building combined with the light and airiness partly of a glass roof with windows and doors to suit. An Orangery will provide your home with a unique and luxurious extra living space that you and your family can enjoy throughout the year. Warmlite Orangeries extension will not only increase the value of your home but give you a light an airy space to live and entertain. Our orangeries are often extensions to kitchens and really do become the heart and soul of your home. All our orangeries are bespoke designed, ‘tailor-made’ and built to our very high standards. We will design and build your orangery extension using the very best materials and glazing. Orangeries can also be a pool enclosure, a dining room, a study or even a kitchen or simply a room to relax in with family and friends. Our Orangery extension builders in SW London offer the complete service which includes initial advice on the design with drawings provided. We specialise in all aspects of the construction from start to finish, from planning applications, through to plumbing and electrical requirements and floor coverings. Bespoke Orangery builders in SW London with a 10 year guarantee. 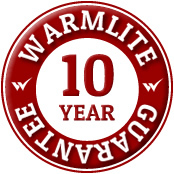 All Warmlite orangeries are covered by our 10 year guarantee. This gives you the peace of mind that in the unlikely event something should go wrong with your any aspect of orangery, you can get it fixed quickly and conveniently at no cost to you. Orangery or orangerie were buildings in the grounds of fashionable residences from the 17th to the 19th centuries. They were built and given a classic architectural form. The orangery was similar to conservatory or greenhouse. The name ‘orangery’ reflects its original use of the building where citrus trees would be housed during the harsh winter months under cover, able to survive through frosts though not expected to flower and fruit. The orangery provided a luxurious extension of the normal range and season of woody plants, extending the protection which had long been afforded by the warmth offered from a masonry fruit wall. A century after the use for orange, lemon and lime trees had been established, other varieties of tender plant such as shrubs and exotic plants also came to be housed in orangeries, which often gained a stove for the upkeep of these delicate plants in the cold winters of northern Europe. Orangerie originated from the Renaissance gardens of Italy, when glass-making technology enabled sufficient expanses of clear glass to be produced. In the north, the Dutch led the way in developing expanses of window glass in orangeries, though the engravings illustrating Dutch manuals showed solid roofs, whether beamed or vaulted, and in providing stove heat rather than open fires. This soon created a situation where orangeries became symbols of status among the wealthy. The glazed roof, which provided sunlight to plants that were not dormant, was a development of the early nineteenth century and more akin to the orangery we see today. One of the finest examples in England is not far at Kew Gardens. The Grade I listed Orangery is Kew’s only surviving plant house designed by Sir William Chambers. At one time this was England’s largest glasshouse. For further information about building a beautiful orangery in SW London, a free site survey with a no obligation quotation or to arrange an appointment.